“Nothing annoyed Dickens more than the idea that any kind of worthwhile writing could be done easily,’’ Michael Slater tells us in his thoroughly researched and persuasively presented biography. Yet, much of Dickens’s writing seems to flow smoothly and effortlessly, as if it poured from him in a steady, even stream. In fact, as Slater demonstrates, Dickens labored over all of his productions, writing, rewriting, correcting, considering, expanding, contracting. 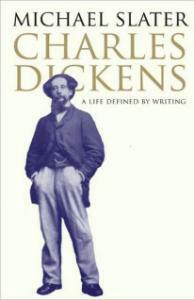 Writing was not an idle amusement, Dickens insisted, but required, “patience, study, punctuality, determination, self-denial, training of mind and body, hours of application and seclusion.’’ It is even more amazing then that Dickens produced the quantity of writing he did, not only his famous novels, but his children’s stories, Christmas books, journalism, travel writing, history, verses, dramas, reviews, speeches, and letters. He also edited and published several journals, collaborated with friends, staged plays, fought for the poor and the abused, organized for international copyright laws, and restlessly walked the streets. Married (unhappily) with many children, he ran several homes, entertained extravagantly, traveled to America for profit and around Europe with family and jolly companions. Late in life, after leaving his wife, he ran two households, hiding away his mistress. Slater faithfully records his movements of mind and body, making few psychological speculations, although he makes much of Dickens’ boyhood misery as a “little labouring hind’’ in the blacking warehouse. David Nokes introduces James Boswell about half way through his new biography of Samuel Johnson, differentiating the other biographer’s mission from his own by saying that Boswell had “a separate and utterly distinct agenda to perform.’’ He goes on to describe Boswell’s memory as “plausible’’ but “highly deceptive’’ and notes that he spent only 426 days with Johnson during his last 21 years. In Nokes’s view, Boswell concentrated on the public Johnson, whose conversation bristled with clever quips, ironic definitions, and witty descriptions. Nokes’s own “agenda’’ focuses on presenting Johnson as a serious thinker and scholar. Nokes tells the familiar story of Johnson’s struggles - his delay in completing his degree, his difficulty in securing an academic appointment, his failures as a dramatist, his years of poverty despite his advantageous marriage, his lonely toil as a lexicographer, editor, critic, novelist, and biographer. But, unlike Boswell, he considers the points of view of those close to Johnson who spent far more personal time with him, such as his wife, Tetty, his intimate friend and benefactor Hester Thrale, and his servant Frank Barber. This sensitively conceived and crafted novel begins with the disturbing image of a large dog stranded far out on a lake on an unmoored dock. His rescuers don’t know why he was abandoned on the dock or why he responded with such vicious ingratitude to rescue. They suspect his owner left him when he took a final, fatal plunge into the water. Unsettling events accumulate - a prolonged blackout in an area that should be protected from such failures, an estranged husband asleep or passed out on a porch swing, sudden claustrophobia, choking. These events happen in southern Wisconsin to a group of well-meaning people - a man who runs a food co-op, a woman who writes about cheese-making, a college fund raiser. Barbara Fisher is a freelance writer who lives in New York.